It is without a doubt that we are living in a busy society today where people often choose instant and readily available food to avoid the hassle of food preparation. With this, an increasing number of fast-food chains, restaurants, cafes, and diners have emerged in order to meet the demands of the consumers, which result in a tight competition among them. Hence, in order to stay on top of the competition, sellers must strive hard to improve all their marketing strategies and tools, and these include, of course, their menus. When it comes to readily available food, among the top food on the list is the burger. 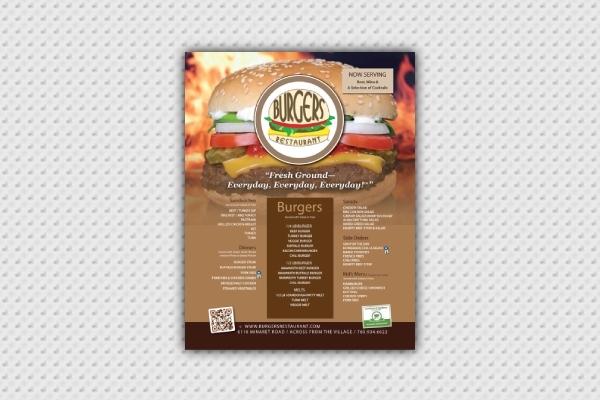 So, when you are offering a variety of burgers to your customers, you may check out these burger menu templates and examples that will surely help you achieve a menu that is both presentable and functional. Running a burger shop in your locality? 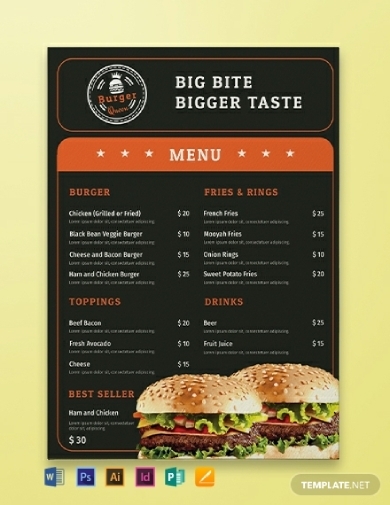 Build your own branding with the use of this attractive and appetizing classic burger menu template. This is easy to download, print, and edit, hence very convenient for every user. You do not need to worry whether you are a pro or a beginner in designing a menu since this can be edited using various user-friendly software applications that can open Illustrator, Pages, InDesign, Photoshop, MS Word, and Publisher. Your desired burger menu design can be achieved in just a few clicks, so do not miss this opportunity to own a professionally designed menu template. 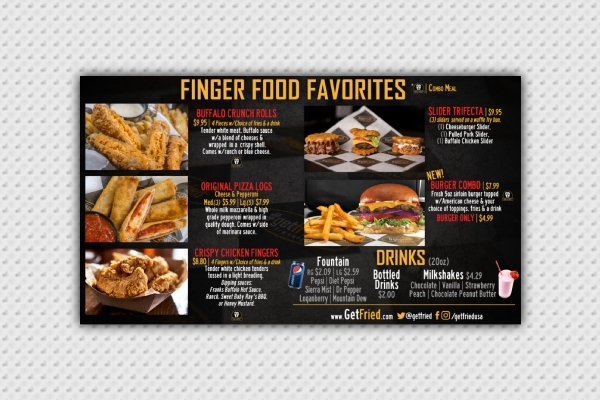 In a typical burger shop, apart from the burger, it also offers finger foods, such as wedges, chicken fingers, pizza logs, and fries, similar to the food included in this burger and finger food menu. Note that when you are creating a menu, you must not only focus on the aesthetics but also on its overall functionality. You have to incorporate attractive names for your food and present them in a font type, size, and color that is readable to your audience. A brief and enticing description of the food will surely aid your customers’ imagination to make them crave more and get interested in the food. Similar to the previous item, in this burger menu example, a burger also typically comes with a steak as many people will regard them as a complement to each other, but this does not mean that the list of food that must be contained in the menu will only be limited to burger and steak. As you can see in this example, also included in the menu are as follows: breakfast special, French toast special, pancake special, omelets, breakfast burritos, breakfast sandwiches, and side orders. There are a lot of types of burger that is offered worldwide, so when you present a burger menu, you must be specific on the type of burger that you are offering. A high-quality photo of the burger can also help people to visualize the burgers that are available to be purchased and to differentiate one burger from another. Just like in this elegant burger menu, several types of burger are presented—hamburger, cheeseburger, bacon cheeseburger, BBQ bacon burger, mac and cheese burger, and many others. As can be seen in the example, the bun of the burgers may be similar but the inside content differs. When you offer premium burgers, it is fitting and proper that you will promote them using advertising tools that are proven effective in marketing your goods. Apart from the flyers, banners, posters, and brochures, a menu is also proven effective in luring people to try your food. 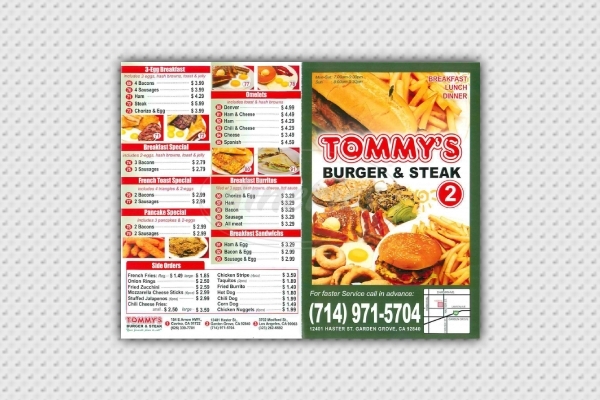 With the help of excellent graphics, photos, and other design elements, you can surely achieve a menu that will effectively promote your business. 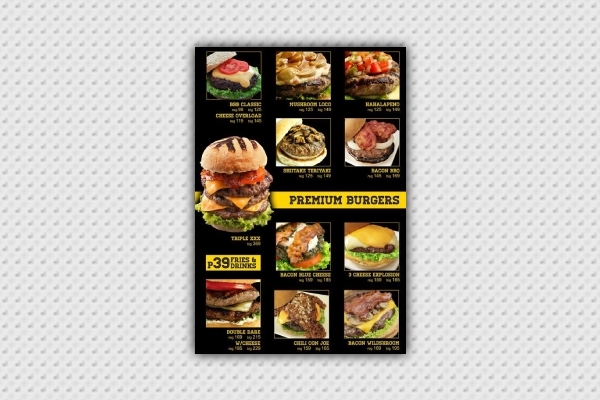 Similar to this premium burger menu, it incorporates mouth-watering photos of their burgers that are of high quality. Moreover, the black background color perfectly complements the yellow and orange colors on the pictures, making the photos more attractive and highly appealing. 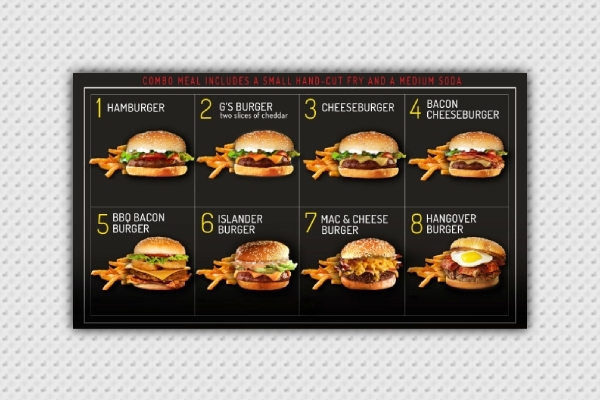 If you opt for a minimalist burger menu design, then you can refer to this restaurant burger menu. Do not forget to include your company logo, a catchphrase or slogan of your company, the types of burgers that you are offering, and, of course, your contact details, such as your contact number, website, email address, and social media account. You contact information is important in order to invite people to communicate with you in case they some concerns, feedback, suggestions, orders, reservations, among others. This would also prompt people that you are good at entertaining people since you keep your communication lines open for them. These are the small yet important details and menu elements that you must not forget to include in your burger menu. So, the next time you are going to create a burger menu for your business entity, do not forget to refer to these examples or use the template provided so you can edit and design your menu in just a snap.